Millennials are tearing down the stigma that has surrounded issues of mental health and mental illness in the generations that came before them -- though the stigma isn't completely gone. That's among the results of a survey of almost 900 young people done by a class of American University students as part of a semester-long examination of how millennials and mental health. The report showed broad acceptance of mental illness among the young people surveyed. More than 85 percent of those surveyed said they would be comfortable making friends with or working on a project with someone diagnosed with a mental illness. More than six out of 10 said they would be comfortable dating someone with a mental illness. Half said they would vote for someone with a mental illness. But seven out of 10 said that being unable to talk to family or friends would inhibit them from seeking help. Cost and health were also among the biggest issues that kept millennials from seeking treatment for mental health, the survey found. The survey was one part of the coverage by American’s Writing for Convergent Media Class. NBC Washington was proud to partner with the class during the Spring semester as part of our Changing Minds campaign. 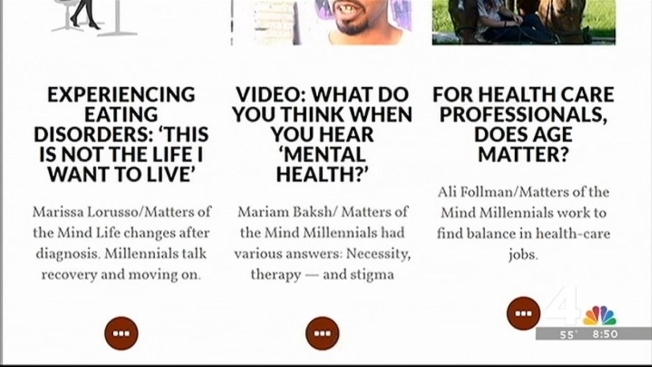 To see all their "Matters of the Mind" coverage, click here.